I feel like I haven't written in forever! I've had a good past few days. I ended up going to the movies Friday night, and then Saturday night I went to my friend's boyfriend's house to celebrate her birthday with a few other people. I didn't know anyone but her, and it's not like me to enjoy myself so much around people I don't 'know,' but all in all I had a good evening. And my baby girl turned 8 months that same day, so I was a little off, anyways. But I'm getting off track! The point of writing about being at the birthday celebration/cookout is that around 11:30ish, I saw the little email icon at the top of my phone. I try not to get too excited when I see it, because although I do have an email account pretty much designated for emails about my daughter, my car insurance updates and bank notifications get sent to that email also. So my heart skips a beat (almost literally) every time I see it, and then it's never from her. But this time when I looked, it was from her, with the subject line: "Pictures :)" (!!!!!!!!) I didn't want to look at them on my phone screen for the obvious reason that they are squished into a 4 x 3 window. The party was thinning out anyways so I said I was going to go and waited for hours for some guys to move their trucks which were blocking my car in. In reality, I must have only waited two minutes, but it felt like hours. Finally I got to my laptop and she sent me SO many photos. She had to send them grouped together as a pdf file - that's how many there were. In it, she included my little girl's first day at the beach, first time standing in the water, and first carousel ride. She has an ear-to-ear grin on in the ones where she's on the carousel, she wasn't scared at all! I marveled at the photos for probably an hour, then emailed her back, thanking her and telling her my favorites. She wrote back, and sent a couple more with her reply. Em must have been napping, because we exchanged 5 or 6 emails back and forth within about two hours. I woke up yesterday morning to yet another from her, with one more picture. I wrote back in the afternoon, and then last night she sent me another, with the subject line: "You're going to love this" and.....I loved it! 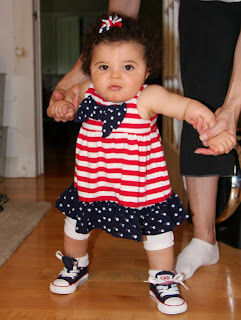 It was a photo of my little girl in her '3rd of July' outfit with the sneakers on! Oh my goodness, I can't tell you how happy it made me. I have been ecstatic since then. Fast forward from last night to this morning - I wake up to the email icon again. Another picture, closer up, of her in her patriotic outfit. I am over the moon right now, but for some reason not as happy as I feel I should be about this. Still very very happy - but something's still missing, and I can't figure out what exactly it is. Every single day for the past 8 months I've checked my email in anticipation, and now here I am getting an average of 3 emails a day from her since Saturday, and don't get me wrong, I love it, but I'm still kind of "meh." Maybe it's because I wish I were with her on this beautiful day? Who knows. I'm not gonna let it get me down, though, I know that for sure. Oh my goodness! The 4th of July outfit is just adorable! What a happy baby! :) My daughter is 11 months and the pictures and updates truly make all the difference.